A major challenge in mastering risk literacy is coping with inevitable uncertainty. Fortunately, uncertainty in the form of risk can be expressed in terms of probabilities and thus be measured and calculated or “reckoned” with (Gigerenzer, 2002). Nevertheless, probabilistic information is often difficult to understand, even for experts in risk management and statistics. A smart and effective way to communicate probabilities is by expressing them in terms of frequencies. riskyr reflects this division by distinguishing between the same two data types and hence provides objects that contain frequencies (specifically, a list called freq) and objects that contain probabilities (a list called prob). But before we explain their contents, it is important to realize that any such separation is an abstract and artificial one. It may make sense to distinguish frequencies from probabilities for conceptual and educational reasons, but both in theory and in reality both representations are intimately intertwined. A prism plot showing frequencies as nodes and probabilities as edges linking nodes. 1. N The number of cases (or individuals) in the population. 2. cond_true The number of cases for which the condition is present (TRUE). 3. cond_false The number of cases for which the condition is absent (FALSE). 4. dec_pos The number of cases for which the decision is positive (TRUE). 5. dec_neg The number of cases for which the decision is negative (FALSE). 6. dec_cor The number of cases for which the decision is correct (correspondence of decision to condition). 7. dec_err The number of cases for which the decision is erroneous (difference between decision and condition). 8. hi The number of hits or true positives: condition present (TRUE) & decision positive (TRUE). 9. mi The number of misses or false negatives: condition present (TRUE) & decision negative (FALSE). 10. fa The number of false alarms or false positives: condition absent (FALSE) & decision positive (TRUE). 11. cr The number of correct rejections or true negatives: condition absent (FALSE) & decision negative (FALSE). Whereas N specifies the size of the entire population, the other 10 frequencies denote the number of individuals or cases in some subset. For instance, the frequency dec_pos denotes individuals for which the decision or diagnosis is positive. As this frequency is contained within the population, its numeric value must range from 0 to N.
As the 4 frequencies hi, mi, fa, and cr are not further split into subgroups, we can think of them as atomic elements or four essential frequencies. All other frequencies in freq are sums of various combinations of these four essential frequencies. This implies that the entire network of frequencies and probabilities (shown in the network diagram above) can be reconstructed from these four essential frequencies. by the actual combination of condition and decision. It may be tempting to refer to instances of dec_cor and dec_err as “true decisions” and “false decisions”. However, this would invite conceptual confusion, as “true decisions” actually include cond_false cases (cr) and “false decisions” actually include cond_true cases (mi). The notions of probability is as elusive as ubiquitous (see Hájek, 2012, for a solid exposition of its different concepts and interpretations). For our present purposes, probabilities are simply numbers between 0 and 1. These numbers are defined to reflect particular quantities and can be expressed as percentages, as functions of and ratios between other numbers (frequencies or probabilities). 1. prev prevalence The probability of the condition being TRUE. 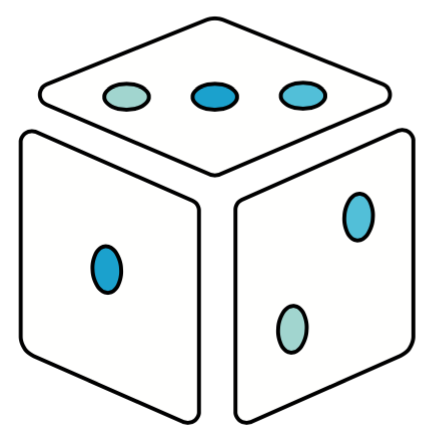 2. sens sensitivity The conditional probability of a positive decision provided that the condition is TRUE. 3. mirt miss rate The conditional probability of a negative decision provided that the condition is TRUE. 4. spec specificity The conditional probability of a negative decision provided that the condition is FALSE. 5. fart false alarm rate The conditional probability of a positive decision provided that the condition is FALSE. 6. ppod proportion of positive decisions The proportion (baseline probability or rate) of the decision being positive (but not necessarily TRUE). 7. PPV positive predictive value The conditional probability of the condition being TRUE provided that the decision is positive. 8. FDR false detection rate The conditional probability of the condition being FALSE provided that the decision is positive. 9. NPV negative predictive value The conditional probability of the condition being FALSE provided that the decision is negative. 10. FOR false omission rate The conditional probability of the condition being TRUE provided that the decision is negative. 11. acc accuracy The probability of a correct decision (i.e., correspondence of decisions to conditions). 12. p_acc_hi – The conditional probability of the condition being TRUE provided that a decision or prediction is accurate. 13. p_err_fa – The conditional probability of the condition being FALSE provided that a decision or prediction is inaccurate or erroneous. 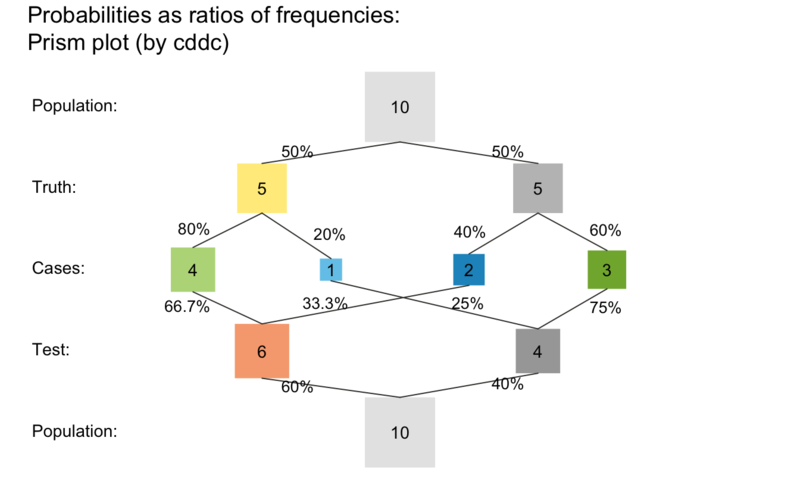 Note that the prism diagram (plot_prism) shows a total of 18 probabilities: 3 perspectives (by = "cd", by = "dc", and by = "ac") and 6 links denoting probabilities per perspective. However, as some probabilities are the complements of others, we currently do not explicitly identify all possible probabilities. The prevalence prev (1.) only depends on features of the condition. The proportion of positive decisions ppod (6.) only depends on features of the decision. The accuracy acc (11.) depends on prev and ppod, but unconditionally dissects a population into 2 groups (dec_cor vs. dec_err). by condition: conditional probabilities (2. to 5.) depend on the condition’s prev and features of the decision. by decision: conditional probabilities (7. to 10.) depend on the decision’s ppod and features of the condition. 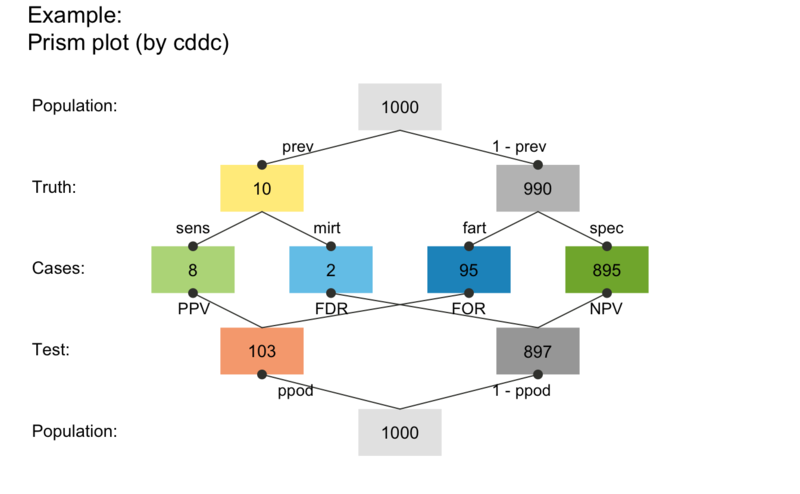 by accuracy: conditional probabilities based on accuracy acc are currently computed, but – in the absence of a commonly accepted term – named p_acc_hi and p_err_fa (12. and 13.). Although this is how the functions comp_PPV and comp_NPV compute the desired conditional probability, it is difficult to remember and think in these terms. Instead, we recommend thinking about and defining all conditional probabilities in terms of frequencies (see below). the ratio’s denominator is the frequency of the condition (Y) being the case. A prism plot showing how probabilities can be computed as ratios of frequencies. Verify that the probabilities (shown as numeric values on the edges) match the ratios of the corresponding frequencies (shown in the boxes). What are the names of these probabilities? What is the frequency of dec_cor and dec_err cases? Where do these cases appear in the diagram? The parameter values in the example do not require any rounding of frequencies. Change them (e.g., to N = 5) and explore what happens when alternating between scale = "f" and scale = "p". Gigerenzer, G., & Hoffrage, U. (1999). Overcoming difficulties in Bayesian reasoning: A reply to Lewis and Keren (1999) and Mellers and McGraw (1999). Psychological Review, 106, 425–430.